Now about Nazli. Nazli is almost ten and is now going to a mainstream school called ENKA in Istanbul, Turkey. The school is partially run by Americans, based on multiple intelligences and the Berkeley GEMS program. Nazli is the only child with Down syndrome in the class, but although there is a special instructor for her at school this year she has integrated herself fully with the rest of the class. Nazli is now in the third year and we have no specific problems in her development. She is taking ballet and piano lessons and she's quite a girl indeed. She is trying to speak English full sentences at home. 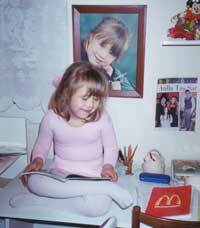 Nazli knew how to read and write before she went to school. As a matter of fact she started to read when she was 3½. Nazli was 1 year old when we visited The Sarah Duffen Center in the UK and Sue and Gillian showed us the flash cards. Thanks to you we learned how to teach her to read. With the material you gave us we started first of all with flash cards, Makaton and Portage at home. Of course we adapted them to Turkish. When she was 3½, she could use short sentences; we started to practice with non picture sentences. Her pronunciation and grammar have always been exceptionally good. 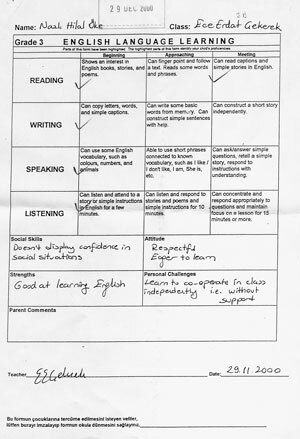 She is talkative at home but she improved at school. She refuses to speak on the phone and says "I cannot see them father". With respect to second language: Nazli went to a mixed prepschool run by an English lady where she started to get used to hearing English. 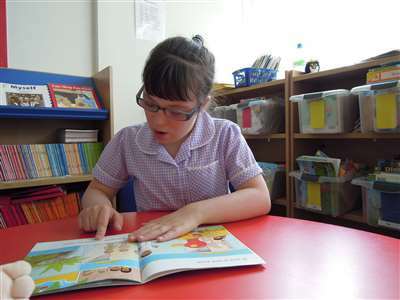 ENKA is a bilingual school and Nazli loves reading the Ladybird series. Again we taught her English by using the same Buckley method, i.e. using flash cards, but this time they were in English. Now she can make sentences in English. We love her and we are ever so grateful to you.